Just when we think we’ve done every possible custom jewelry design around, inspiration will strike. Thank goodness, too! Because that’s what makes this job so exciting. Not only do we do custom jewelry for our customers in Akron, Ohio and Dublin, Ohio, but now, with the web, we have customers all over the globe! Tamara contacted us from out of state about restyling some jewelry for her. She had some loose diamonds and old gold that were not her style anymore. She wanted something simple, yet kind of funky. And she wanted to wear it with everything. 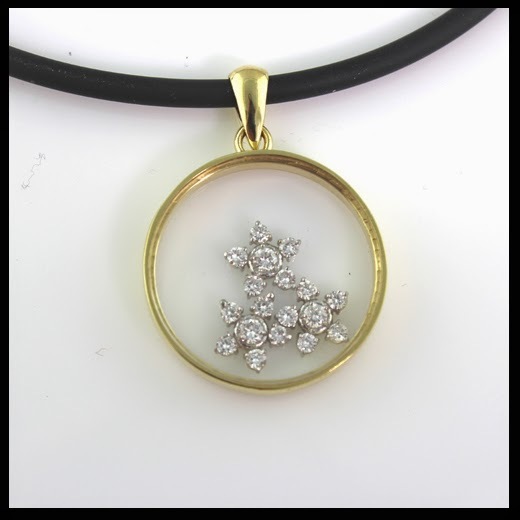 Enter our floating diamond circle pendant! We’ve done these custom diamond pendants before – in fact, I have one myself. We use watch crystals and then trap the diamonds between the glass for a great modern look. Tamara wanted a more uniform design. So we used her diamonds to make these gorgeous diamond flowers, which float inside the glass. This pendant is both deliberate and random. Depending upon which way the diamond flowers move, a new picture is created! Brilliant! Well, this idea caught the eye of Erika, one of our custom jewelry designers. She was helping us out with a bracelet idea we were making for The Dublin Arts Council’s Garden Party event. Instead of diamonds though, we added silver and gold discs that moved around between the glass. See how this goes? Each new piece we do, inspires another piece. We’ll never run out of ideas! This custom bracelet was donated to the Dublin Arts Council for their spring fundraiser. Spring cleaning has never been so beautiful!